Watch out Midlo. Lake Braddock is coming for you again. In a similar path taken last year en route to their shocking Group AAA state title over the four-time defending champions Midlothian, the Lake Braddock girls (pictured above by Ted Plunkett) are coming together and running their best as a team in each race leading up to Great Meadow. Last year, Lake Braddock lost their district meet only to bounce back and win the regional meet. The same reverse finish order occurred in 2010 with the Lake Braddock girls on Thursday recovering from a district meet title loss to West Potomac by turnaround in a week's time to claim the Northern Region title at Burke Lake Park. The difference from last year's regional meet is that Lake Braddock faced even tougher competition from not only their Patriot District champion rivals West Potomac (3rd, 108 pts) but the previously undefeated Thomas Jefferson girls out of the Liberty District. The Thomas Jefferson girls, who had defeated the likes of Bishop O'Connell and Blacksburg during their invitational season, had even gotten back to full strength with the return of Lisa Junta to their lineup after missing much of the last half of the cross country season. Led by individual champion Sophie Chase (pictured left by Ted Plunkett), who finished second in the regional race last November as a freshmen, the Lake Braddock girls matched up as the superior team through four runners and nearly putting three runners ahead of TJ's top finisher Kelly Rogers (8th, 18:34). Chase won by 12 seconds over Thomas Edison's Myah Hicks (17:50) as she bettered her district time by four seconds on the historic Burke Lake 2.98 mile course with a 17:38 clocking. Freshmen Hannah Christen was missing from the district meet due to illness and she made a huge difference once plugged back into Coach Mike Mangan's lineup finishing fourth overall with a time of 18:13 to win top freshmen bragging rights over Robert E. Lee's Bailey Kolonich (6th, 18:16). Casey Lardner (10th, 18:34) made for three Lady Bruins among the top 10, while Katie Roche (22nd, 18:54) and Tara Landy (38th, 19:24) for a final winning team score of 71 points to put them 31 points ahead of runner-up Thomas Jefferson (2nd, 102 pts). Despite losing their first meet of the season, the Thomas Jefferson girls still appear to be a state meet podium caliber squad and Junta's return is promising as another week of running under her might allow her to move up from her current fifth position on the team at the regional meet to higher spot and individual finish to lower the team score. Rogers and Stephanie Marzen (12th, 18:37) were the team's two All-Region performers, while Sarah Stites (23rd, 18:56) made for a third runner under 19 minutes. The Liberty District champions actually put six runners ahead of Lake Braddock's fifth runner with Rehka Schnepf (31st, 19:15), Junta (32nd, 19:17), and Sarah Neilsen (33rd, 19:18) finishing in a line together, but definitely will need better front running or their pack as a whole to move up for the state meet to fare better against the likes of Lake Braddock and top ranked Midlothian. The Patriot District champion West Potomac girls are certainly not out of the state meet top three podium picture either as they almost became the second team to defeat the TJ girls trailing them by only six points in third place with 108 points. The duo of Sarah Jane Underwood (8th, 18:31) and Dale Lescher (11th, 18:36) held their own up front for All-Region honors and their remaining top five kept their spread under one minute with Sophia Passacantando (19:01), Colleen Boye (19:05), and Sami Miller (19:29). The West Springfield girls showed how strong the Patriot District girls are this year by becoming the third team from the district to qualify for the state meet with a score of 130 points for fourth place to shut out Concorde District champions Oakton (5th, 164 pts) and Liberty District runners-up Langley (6th, 167 pts) from state meet appearances. It is probably a testament to his talent as he has pretty good genes with his father Abdi being a 1987 world champion at 1500 meters who boasted PR's of a 3:49 mile and 1:43.6 800, but the rest of the competition in the state of Virginia has to be scared that Annandale junior Ahmed Bile (pictured right by Dave Watt) is already running so well in only his second race back after missing the entire cross country season prior to the district meet due to injury. Bile bidded his time as he lurked behind the race leaders after 2 miles in Abraham Yacob of Robert E. Lee and Concorde District sophomore champion Sean McGorty of Chantilly before striking and using his top gear in the last quarter mile of the course to pull them in and pull away for a 15:22 win. The sophomore McGorty ran a tough race as part of the lead group throughout to hold off a hard charging W.T. Woodson junior Paul Gates (3rd, 15:26.8) for second place in 15:26.3. A total of 17 runners broke 16 minutes on the Burke Lake 2.98 mile course to make for a 15:57 cut-off for top 15 All-Region honors. It was a Patriot District battle for the boys' team crown between West Potomac (1st, 78 pts) and Lake Braddock (2nd, 84 pts). Lake Braddock closed the gap on West Potomac from their runner-up district meet to nearly match the Lake Braddock girls with a first place trophy as well by improving their fifth runner situation by 23 seconds from the district meet as the two squads ran nearly identical time averages from their district to regional races. The West Potomac boys are looking to get on the podium next weekend with the power of depth and pack, which was at a 33 second spread on Thursday with Brady Corum pacing the team in ninth place with a time of 15:44. Ben Aleixo (15:57) was West Po's top finisher at the district meet and followed Corum in by snagging the final All-Region spot in 15th place. Mark Hanak (16:09), Marc Lotterie (16:15), and Corey Rosenberg (16:18) rounded out Coach Jenn Dietz's top five for a team score of 78 points to give Dietz her first regional team title in her first season as the head cross country coach at West Potomac. Lake Braddock's Sam Rubenking was racing with the leaders over two miles before finishing fifth overall with a time of 15:35. Rubenking was one of three Lake Braddock runners to break 16 minutes as they were the only school to have a trio under the time barrier including Rubenking, Luke Sohl (11th, 15:53), and Nick Tuck (14th, 15:56). The South Lakes boys will be advancing to their first state meet in a decade as they might have had a goal of challenging for a regional title, they will certainly a third place finish (130 pts) and guaranteed spot in next Saturday's VHSL State Cross Country Championships after a long drought. With a few traditional powers in Oakton (8th) and Thomas Jefferson (6th) encountering down years, it has opened the door for new teams to break into the top four and represent the Northern Region at the state meet including a big surprise in fourth place with Herndon (4th, 147 pts) edging out James Robinson (5th, 152 pts) for the final state meet spot after finishing third at the district meet behind Robinson and Oakton. They were considered a long shot to qualify compared to other teams for that fourth spot. Northern Region Championships Results: Boys Race - Girls Race Photo Gallery by Ted Plunkett Photo Gallery by Dave Watt Race Videos by Ed Lull: Boys Race - Girls Race Race Videos by Chris Medrano - To be posted on Friday. 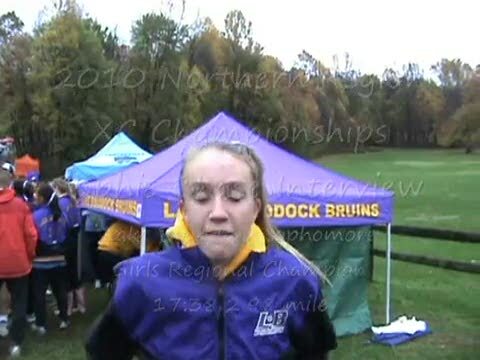 Lake Braddock sophomore Sophie Chase won the girls regional title in 17:38. 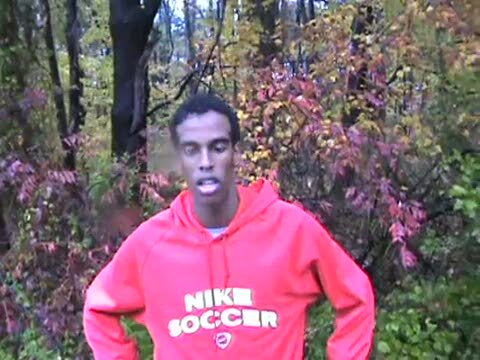 Annandale junior Ahmed Bile won the Northern Region boys title in 15:22.